Answer: The Olympics started in 776 BC. The Ancient Greeks pioneered sporting contests and one of those contests was the Olympic games. Records indicate that the first Olympic games began in 776 BC in Olympia in the southwest of Greece. The Ancient Greek Olympics were very popular and took place every four years. They were held in honour of the Greek God Zeus. Interestingly women were not allowed to compete and only Greek national men were allowed to enter the competition. Initially the Olympics begun as a one day contest of wrestling and athletics, however the games quickly developed to last a week and have many more sports. An often forgotten fact was there were other sporting contests alongside the Olympic games such as the; the Pythian Games which took place every four years just outside of Delphi. And the Isthmos games which took place every two years near Corinth. Although both were very popular neither of them could compete with the Greek Olympics. According to Greek mythology the God Heracles was the founder of the Ancient Greek Olympics. Some records indicate that Heracles ran a race in Olympia and declared that the race should be repeated every four years. Winners were presented with a wreath of laurel leaves, which were highly regarded by the Ancient Greeks, due to the God Apollo being known for wearing a laurel wreath. When the modern day Olympics were revived the laurel was appropriately chosen to symbolise the games. The first ever winner of the greek olympics was a baker from the region of Eleia which was the region of Olympia where the olympic games were founded. He was called Coroebus. A Statue of Zeus which was made of gold and ivory was placed inside the temple at Olympia. It was 42 feet tall and is now one the seven wonders of the world. Although women were not allowed to compete in the Ancient Greek Olympics there was one instance where this was not the case, and she won! In 396 BC a daughter of a Spartan King called Kyniska won the four horse chariot race known as the tethrippon. She found a loophole in the regulations which allowed women to compete as horse owners (not in the actual race). Women who were married were given the death penalty if they watched an Olympic event. If an competitor backed out of an event he was fined for cowardice. The primary stadium where the ancient Greek Olympics were held could hold 45,000 spectators. It was located on the archaeological site of Olympia. Spectators travelled from every region of Greece and stayed in tents pitched around the stadium. The first ever event of the Ancient Greek Olympics was a foot race of 190 meters. If a race had a tie then the race had to be re run. Unlike with modern day Olympic running ancient Greek athletes started the race standing up. A Greek poet called Pausanias would write stories about how the athletes trained and performed in their races. The ancient Greek athletes were naked when competing. Competing naked promoted the appreciation of the male body and was also a homage to the Gods. Interestingly the word gymnasium which derives from the Greek word gymnos means naked. Ancient Greece was a turbulent era to live in and wars and disputes were common. To protect athletes when travelling to Olympic events a truce called the Olympic truce was made where wars and disputes were halted for the duration of the Olympic games. 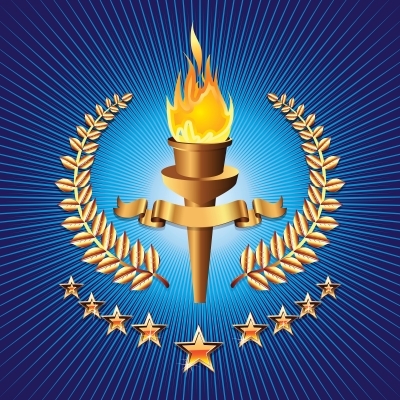 Each Greek state was represented by an athlete or team of athletes. In modern day Olympics it is whole countries that compete with one another. One of the events that took place in the ancient Greek olympics was the Hoplitodromos. Competitors would run either 365 or 731 meters wearing a full suit of armour. This would have been rather comical for spectators as competitors often tripped, collided and fell short of the finish line. On the final day of the ancient Greek Olympics 100 oxen were sacrificed to the Gods and all the competitors gathered for a huge feast. Although the dates vary amongst historians the ancient Greek Olympics were stopped by the Roman emperor Theodosius (or his grandson) in either 393 AD or 435 AD.